I can easily imagine the doubts about Ocean's 8 and what was behind continuing the franchise that started with Ocean's 11 in 2001. With an all female cast, could it be a gimmicky ploy by a Hollywood that hears the constant drumbeat of "remake, remake, remake"? I am hear to tell you that Ocean's 8 is a slick, smooth and successful stand alone film. Debbie Ocean (Sandra Bullock) belongs to what must be a genetically gifted family of charming criminal masterminds that includes her brother, Danny Ocean (George Clooney) from the original Ocean's movies. She is just out of prison on parole and shows off her skills by quickly and easily conning herself into some expensive cosmetics, a new wardrobe and a free hotel room. Right off the bat she has reconnected with former partner Lou (Cate Blanchett) and set out to put together a crew to pull off a heist years in the planning. A movie like Ocean's 8 can live or die on casting alone. Mindy Kaling, Sarah Paulson, Awkwafina, Rihanna and Helena Bonham Carter play the lovely ladies of larceny who each bring their special skills to the job. The goal is to get a ridiculously expensive hunk of a diamond necklace out of a Cartier vault and on the neck of "it girl" actress Daphne Kluger (Anne Hathaway). It will then be stolen from that neck and in a way that Debbie and her crew will not even be suspects. 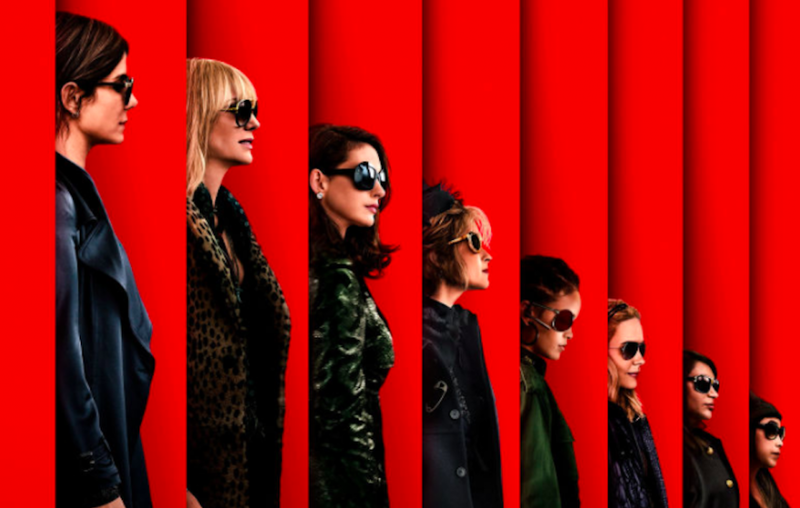 Ocean's 8 is a carefully choreographed movie with everything from the cinematography, the music and even the clothes giving the sophisticated feeling of Ocean's 11 but with added feminine edge. No complaints about the acting at all. Sandra Bullock and Cate Blanchett who take up a lot of screen time have a natural connection and make their interactions seem effortless. Helena Bonham Carter gets some extra kudos for allowing us to see a past version of herself. The quirkiness remains but no screeching, villainous witch in sight. Instead she is a refreshing character with a lot of real vulnerability. The stage might gets a bit full at times and you'll wish that your favorite character got more screen time but I see it as a natural by product of a movie with such a big cast. One last gushing compliment and then I promise I will stop. For those that appreciate fashion, Ocean's 8 has some fabulous clothes. I think Cate Blanchett comes out ahead. Lou is a whirlwind of well cut suits, layers of jewelry and swagger (I can safely say that part is all her). I don't know if Ocean's 8 will spawn a franchise or rest on it's laurels as a fun summer movie but I give it a A.